In my opinion, an off the shoulder top is one of the best shirts for spring and summer. You can create sporty, casual, travel, party outfits with them and, no doubt, you’ll look amazing and chic. Today we’ve gathered for you a collection of printed off the shoulder tops — striped ones. Depending on your body shape and wishes you can choose tops with vertical or horizontal stripes. 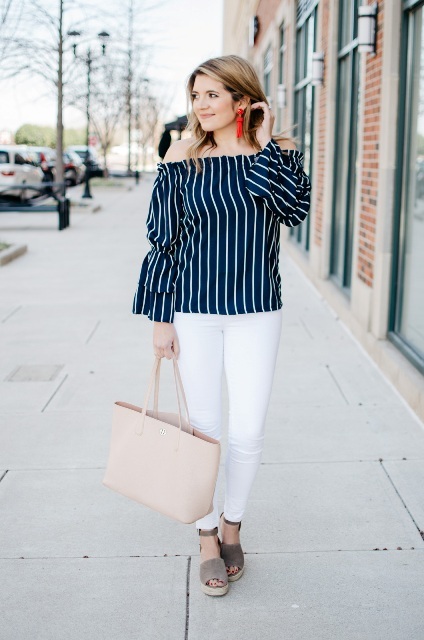 After that, you should think about colors: of course, you can take classic black and white blouses, but if you want to look eye-catching, take a white off the shoulder top with blue and turquoise stripes. Now scroll down to see all ideas. Enjoy! 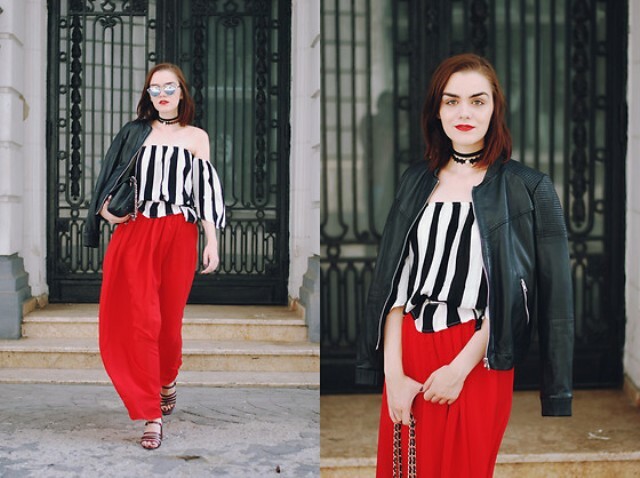 If you like chic and unique outfits, then take a black and white off the shoulder top and combine it with a red wide leg trousers, low heeled sandals, a black leather jacket and a black clutch. Or you can pair jeans with a such top, red suede platform sandals and a black leather bag. 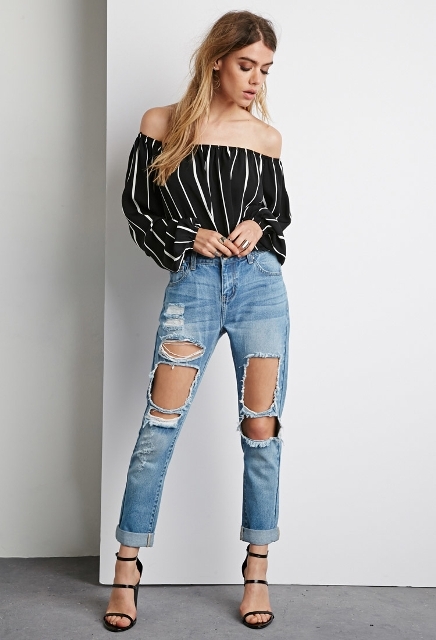 For casual outfits you should pay your attention to distressed jeans and, for example, you can mix them with a black blouse with white stripes and black high heels. Or you can combine a top with high-waisted crop straight jeans, navy blue platform shoes and a marsala chain strap bag. For summer days you need to pair navy blue shorts with a blue and white off the shoulder top, a straw clutch and flat sandals. 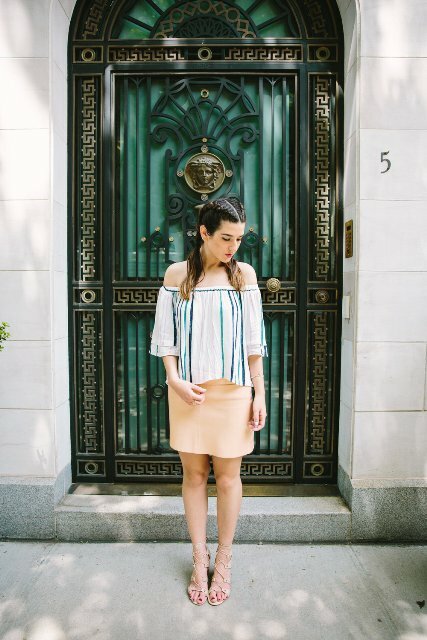 To create a feminine look you should take a ruffled top and pair it with a pale pink pleated midi skirt, beige high heels and a black clutch. 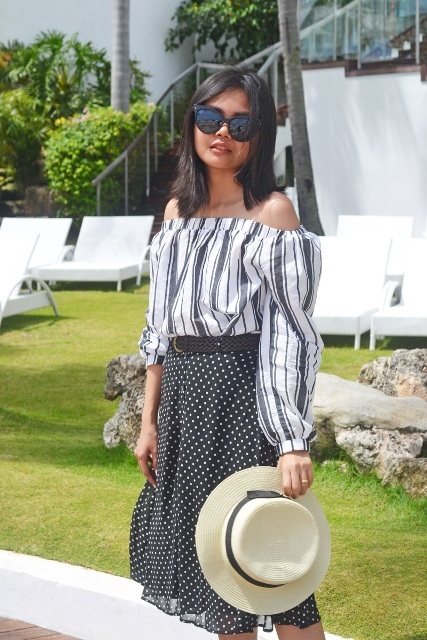 Don’ be afraid to mix various prints, for example, you can combine a top with vertical stripes, a polka dot knee-length skirt, a black leather belt and a hat.